A Pilomatic model shown with black dial, using an automatic ETA 2824-2 movement. During the AWCI annual convention this year, I had the opportunity to sit down with Andrew Perez and discuss his Chicago-based watch brand, Astor & Banks. This year Astor & Banks joined the AWCI Industry Advisory Board (IAB). Perez came to our annual convention to meet and greet fellow AWCI members. He also supported the independent watchmaker and horological education by attending the ELM Trust dinner. Perez started Astor & Banks in 2012 after assembling some watches with some unmarked “off the shelf” components found on the Internet, and mechanical ETA 6497 movements. The company was named for the streets that intersected where his apartment was at the time, Astor Street and Banks Street, in the Gold Coast area of downtown Chicago. He successfully made about a dozen watches in the first few months and sold most of them to family and friends. The next year he started to source some of his own proprietary components in Germany and Asia. He began to sell many more watches as time went on and quickly realized that he was on to something. He has been interested in watches since he was a kid with a modest Timex Indiglo. Being a Chicago native, Perez wanted to do something with watches in his own hometown. In 2002, he entered military service directly out of high school. While serving in the US Army, he was stationed in Germany for about a year. This is when he really began to fall in love with watches. It is apparent when looking at his designs, they reflect a distinct 1970s military style with a modern aesthetics. After serving in the Army for six-and-a-half years, Perez retired from military service as a sergeant. He then earned a bachelor’s degree in economics from the University of Illinois. Currently, he works as executive vice president at Silver IP Communications, a fiber-optic based Internet service and communication company of many commercial and large residential buildings in downtown Chicago. 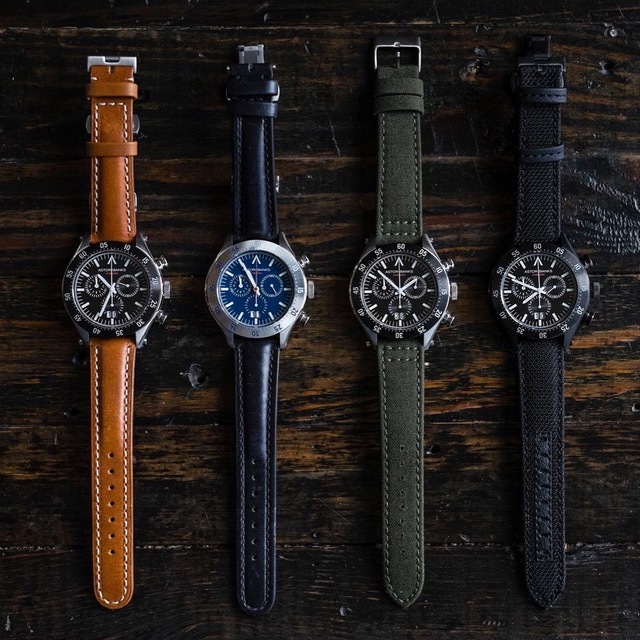 Silver IP also is a partner of Astor & Banks, allowing the watch brand to stay independent and not rely on crowdfunding for their main source of capital investment. The different colors and configurations available for the Chrono collection, using a Ronda quartz chronograph movement. Astor & Banks assembles all their watches in Chicago. Initially, all the assembly was done by Perez himself and a local watchmaker who was teaching him some of the basics of watch assembly. However, this watchmaker moved, and wanting to keep the business in Chicago, Perez sought out another watchmaker to help him. Eventually, he found fellow veteran and CW21 Paul Nichols. Perez and Nichols are the only two people involved in the process, once the components come from the manufacturer. As the company grows, so will the in-house capabilities. They are currently about 60% of the way to bringing full dial and case manufacture in house. They have thought out their process and are methodical, because they want to make sure everything is done right before rushing into it too quickly. Andrew designs all the aesthetics of the watches himself on a sketchpad or in illustrator software. The manufacturers help with the component engineering. They currently offer three different collections of watches: the Chrono, which contains a Ronda quartz chronograph movement; the Pilomatic, which contains an ETA 2824-2; and the AB1405, which contains an ETA 6497 movement. All the cases are made of 316L stainless steel and are paired with leather straps that are made locally in Chicago by Horween Leather Co.